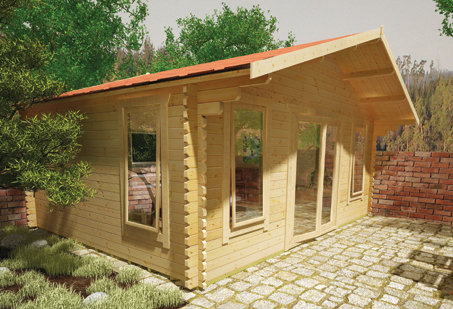 Superior Grade 44mm Interlocking Logs The Sutton Log Cabin is an attractive, spacious garden building. The Sutton main features include large, full length, double doors and windows, helping the cabin make full use of the natural light. The windows come with FREE toughened glass as standard. Complementing the multitude of windows are the extra large doors providing access to this log cabin. The roof of the log cabin is fitted with heavy duty mineral felt or the optional extra of the attractive heavey duty roof shingle in one of three colours. Roof and floor boards are 19mm planed tongue and grooved boards. Factory fitted pressure treated weatherproof heavy duty floor joists. Key-lockable opening windows and all doors and windows are professionally draft sealed. Easy fit moular floor for fast and simple assembly.